D’URBAN’s theme for this autumn and winter season is “Japanese style Elegance”. 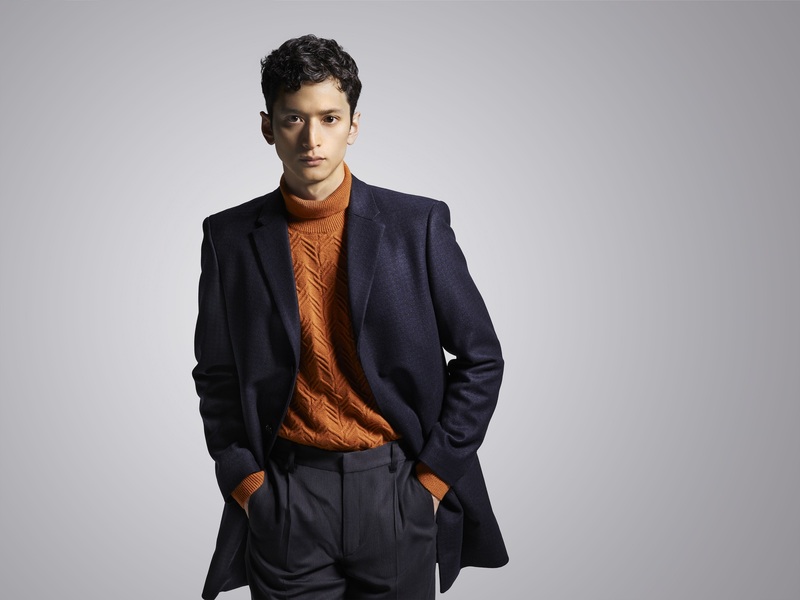 Japan is famous for their textile products and the menswear from the brand this season is made with fabrics specially sourced from Owari in Aichi prefecture. The highly popular J ∞ QUALITY collection remains a highlight of the brand. (The J ∞ QUALITY certification is issued by Japan Textile Federation for all textile products made in Japan.) D’URBAN also presents the urban male with delicately crafted casual wear this season that melds playfulness with dignified elegance. As fall arrives, the collection adapts and reinvents itself from tones of black-and-white to midnight blue, and bringing forth textured greyish-blue accents paired with colors like washed out blues, charcoal greys and milk whites. The interplay of dark and light hues sets the tone for an urban lifestyle. Exude an air of casual sophistication with an understated and textured navy blue camouflage leather jacket with embossed ink prints paired with a same-color cashmere sweater and a pair of high-stretch soft woven light-grey cuffed pants. The same prints are reapplied in many different designs: a regular-wear jacket with accentuated digital prints; or an understated 100% cotton jacquard suit that is great as a casual workday outfit. Winter is usually associated with understated and cool elegance, and the winter collection this year is marked by natural color tones and new tailoring cuts, fusing different materials to marry trend and tradition. The lines are soft and contemporary without compromising on classiness; the luster of leather, the restraint of cashmere and the raucousness of faux denim all lend an air of easygoing nonchalance to the wearer, externalizing the Japanese more-than-skin-deep appreciation of textures and layering. A houndstooth outer coat in a youngish slim profile and neckline presents a clean and neat look. It is paired with a cashmere and wool blend sweater with reverse print brown collar and woven cuffed pants in a fresh new cut – a twist to a classic piece. Speckled grey – highly popular in Japan – is featured liberally in the winter collection: A quality white goose-down coat with casual-styled jacquard pants creates a contemporary look with a mix of dark and light colors. Denim-patterned pants made from dyed fabrics continue to be the choice for everyday comfort. Integrating functionality and contemporary fashion, Mobile Collection, which was launched at the start of the Spring & Summer Collection 2018, was highly popular. 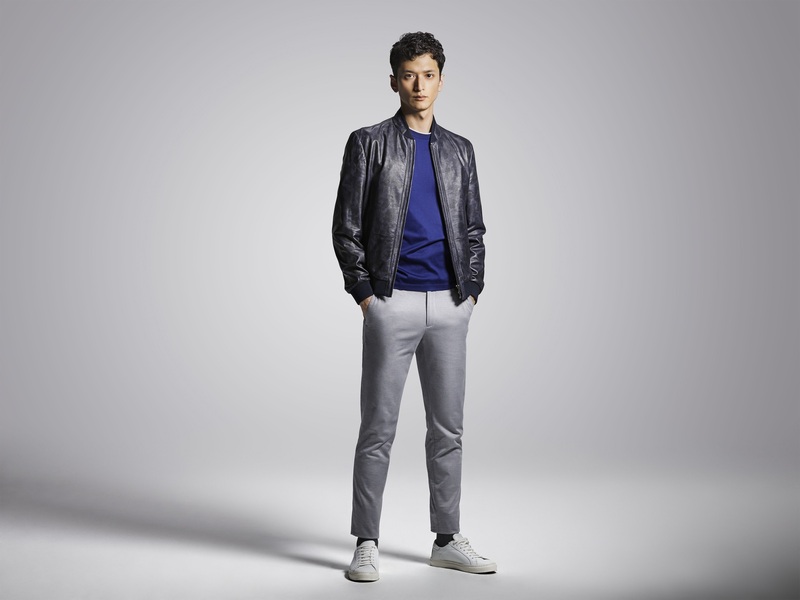 The same concept of integrating functionality into designs continues into the collection in this new season, creating smart menswear for the business traveler – Japan-made stretchable suits, creases-resistant, water-repellent and shape memory jackets with multiple pockets, stretchable casual pants, and more. Careful attention is paid to every single detail, a testament to the fine and diligent touch of Japanese craftsmanship.